Heavy winter downpours have turned some Palestinian lands in the occupied West Bank into a morass of filth and flooding as an Israeli barrier blocks the waters from draining away. In Qalqilya, a town of 42,000 in the northern West Bank almost completely surrounded by the concrete wall, Khaled Kandeel and his family huddled by an open fire in a shed as trash-laden water swelled through his pear orchard. “Before the wall, the water used to drain fine, and flowed down to the sea easily. They could just flip a switch and end our suffering, but they don’t,” Kandeel said, his breath steamy from the winter cold. Drainage channels run under the imposing ramparts but their automated metal gates are mostly closed and now clogged with refuse and stones that block the outflow of storm water. The Israeli military, citing security reasons, generally bars locals from clearing the obstructions or digging their own channels close to the barrier. Planning restrictions, inked as part of interim peace accords by Israeli and Palestinian negotiators almost two decades ago, widely limit locals’ ability to build water infrastructure or repair damaged or polluted wells. But in Hebron, whose old city is a flashpoint of conflict with Jewish settlers, rare coordination with the Israeli military allowed Palestinian officials to lift the concrete slabs which separate the ethnic enclaves to relieve flooding. [The wall] directly impacts the farming, grazing and environment of about 170 communities, the United Nations Relief and Works Agency (UNRWA) says. Hemmed-in residents of northern towns in the West Bank have been deprived of large swathes of rural land, forcing poorly-regulated waste dumping closer to farms and homes. Driving rain could not mask the stench of raw sewage being unloaded from a tanker on a village road outside Qalqilya on Tuesday, its putrid contents mixing with the brown torrent pouring past olive trees clustered on the hills. “Raw sewage is disposed near, or on, agricultural land resulting in the contamination of soil and groundwater,” UNRWA said in a report. On Wednesday morning Palestinian rescue personnel found two bodies of young Palestinian women who had been missing since Tuesday night, after the car they were riding in was swept away by floods between Nablus and Tul Karm. The car and its driver were found several kilometers away with the driver suffering from hypothermia. In the Ein Shams refugee camp in Hebron, a 90-year-old woman was killed and her sister seriously injured when a gas heater caused a fire in their home. In Jenin, a man in his 50s was killed when he slipped near his home and sustained head trauma. Sami Hamadan, head of the rescue services in the Jenin district, reported that more than 90 homes had been flooded and entire families had been made homeless. 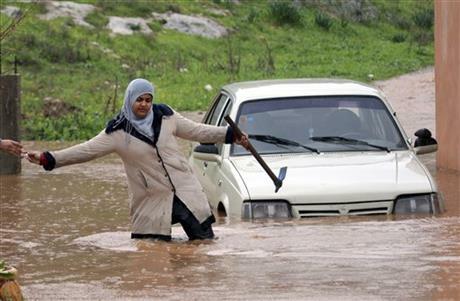 Palestinian Prime Minster Salam Fayyad said the Palestinian Authority would try to compensate those hit by flood damage. 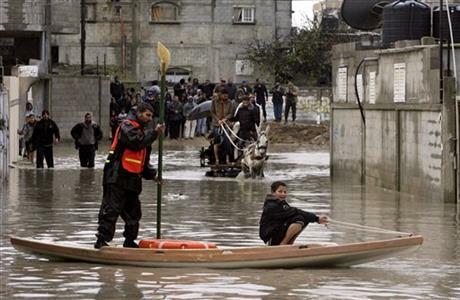 In Gaza 105 people were injured in the flooding, mostly in the city of Rafah, while dozens of homes in other areas were evacuated. In the Gaza Strip, which is still reeling from Israel’s November assault, Ma’an reports that at least 105 people were treated for injuries as “rescue crews used fishing boats to help 25 families trapped in a flooded plain in the southern Gaza Strip on Wednesday,” where 300 homes were reportedly “at risk of flooding.” According the Associated Press, a 24-year-old Palestinian man in Gaza was electrocuted to death “after being struck by a power cable snapped loose by ferocious winter winds.” Ma’an reports that a 17-year-old Gaza boy also died from electrocution as he was repairing the electricity to his home. While there’s no doubt that Israelis have been heavily impacted by this storm as well, the IDF quickly swept in to rescue people and evacuate affected areas.